braces .Ceramic braces were introduced back in the 1980s with the idea of making less visible braces came about.Back in the day, plastic brackets were used for invisible braces, but plastic is porous so it tends to stain more easily. The ceramic composite with standard brands now solves that problem, making ceramic braces a great option.The braces blend in and basically disappear on the teeth. They generally don’t stain, although the ligatures are slightly prone to stains especially if you drink coffee, smoke, or take coloured food regularly. 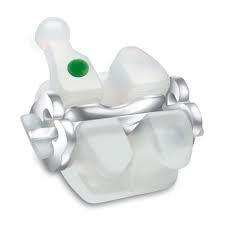 Ceramic braces are strong, especially if they are high-quality. They usually don’t chip or break unless they are badly abused. Ceramic brackets are more expensive than metal brackets. They are also bigger, but they blend in with teeth so this isn’t an issue for most patients. 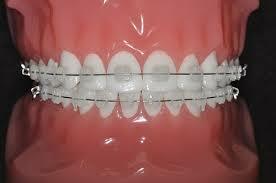 Like traditional metal braces, ceramic braces use clear or white ligatures to hold the archwire in place. The ligatures are little rubber bands, so they can stain because they’re porous. They’re changed at every adjustment. Because ceramic brackets can’t withstand as much pressure as metal brackets can, ceramic braces are not recommended for people who need extensive treatment. 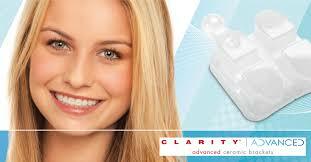 At Dr Chopra dental clinic , we can advise the best option for your needs with a smile analysis. 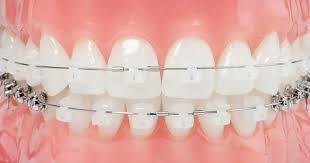 We help you straighten your smile with outing disrupting your whole life to. 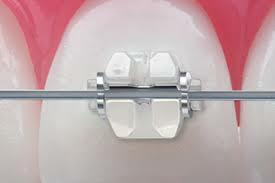 Ceramic Self-Ligating Braces provide all of the benefits of self-ligating braces with the added advantage of translucent ceramic. 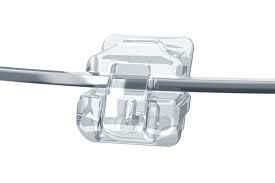 Ceramic self ligating braces blend in with your teeth and provide a smooth, comfortable and extremely durable fit.